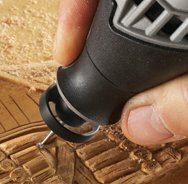 The Dremel Flexshaft is the single most helpful accessory for carving with a Dremel tool. 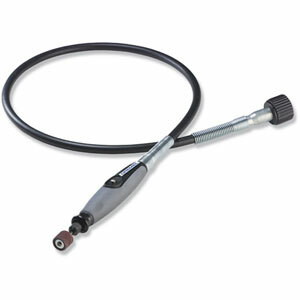 The comfort grip flexshaft handpiece is ergonomically designed, and does not heat up in your hand. The handpiece has an integrated push button shaft lock for fast tool changes, and is compatible with the keyless chuck accessory. 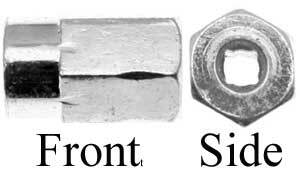 The flexshaft fits Dremel models 100, 200, 275, 285, 300, 395, 398, 400, 780, 800, 4000 and 8200. The flexshaft also includes a drive nut and instructions for installation. GENUINE DREMEL part, factory packaged. The Dremel Dust blower is a small attachment that works with most Dremel models, including Dremel flex shafts. GENUINE DREMEL part, factory packaged. Tip: Keep 2 drum sanding mandrels on hand, one with a fine grit, the other with coarse - you won't have to change the bands when you need a diffferent grit. *Do not run drum sanders at high speeds. 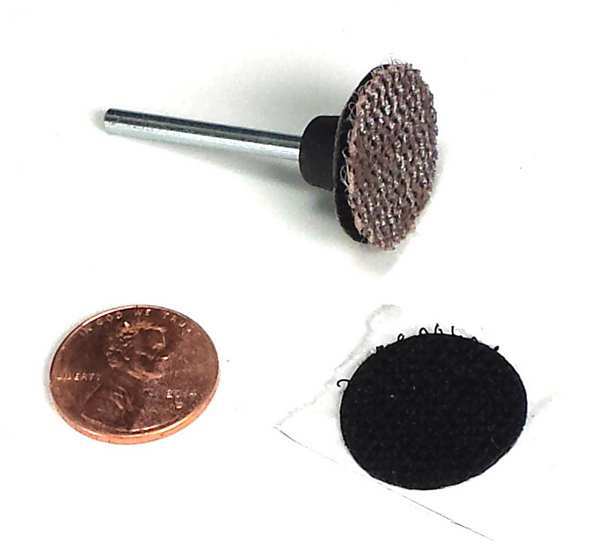 This small sanding attachment works great with your rotary tool, and is an inexpensive alternative for sanding small carved areas, grinding Inlace resin or other small sanding operations. The mandrel has a 1/8" shaft with a mounting head for 3/4" adhesive backed sanding discs. 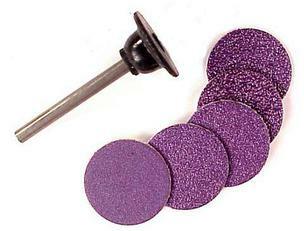 The mandrel comes with a sampler pack of 10 assorted grit discs including 60, 80, 120 and 220. Run these at low speeds. 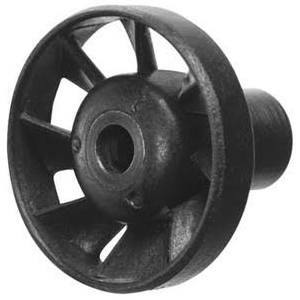 Keyless chuck for off brand (mostly Chinese) rotary tools. 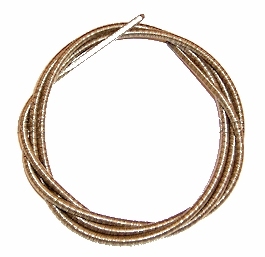 This bur box is made from a thin gauge material. It is strong, but has the advantage of being light weight and inexpensive. If you are tired of rooting through a box looking for the correct bur, or of accidently dumping your burs when using other storage containers, then this bur storage box is the one for you. The case is lightweight and has a handy carrying handle. When the lid is closed, the burs will not fall out, even when the case is turned upside down! Burs fit into predrilled holes in a heavy structured foam insert. They stand upright so you can quickly see and select the bur you need. Each box holds 231 burs (a combination of 3/32" shank burs 1/8" burs. 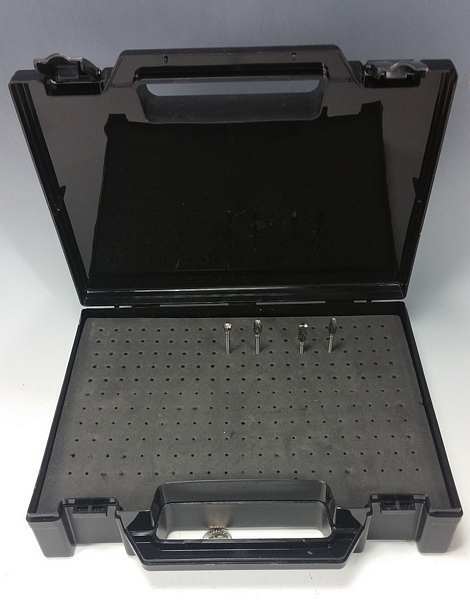 Smaller holes may be enlarged by forcing the larger burs in and expanding the foam) The case measures 7 1/2" x 9" x 2 1/4"
*Looking for Rifflers, Hole Saws and other tools and accessories? To make each page load faster, they are found on the "Tools" page. *Looking for Carving Burs? To make each page load faster, they are found on the "Carving Burs" page. NEW Bur Boxes with lid and carrying handle! Picture this: You are at a class, merrily carving away, when you accidentally catch your bur in your work apron, and now your flexshaft no longer works! As a safety feature, the flexshaft inner spring is designed to snap, to save you from injury, and to protect the handpiece and the rest of your Dremel tool. Arizona Gourds is an authorized Mastercarver Micro-Pro and Ram Carving Tools Distributor. 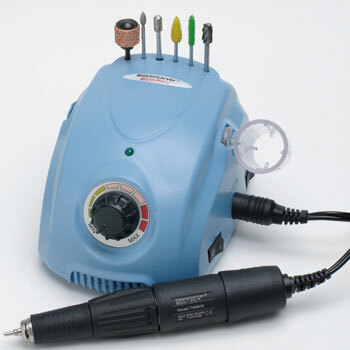 Please use the link button to view the micromotor carving tools page.